If you need to register by bank transfer, please complete this registration form and email it to Cynda Covert, CIVEMSA 2015 Administrator. Conference registration includes access to all technical sessions, coffee breaks, lunches, the banquet dinner, and a copy of the Conference Proceedings. Registration does not include hotel accommodation. Attendees must make their own accommodations. Do not jeopardize the publication of your work in the proceedings! An accepted paper will be published in the proceedings only if the full-fee registration payment for one of the authors is received and correctly processed by March 15, 2015 - no exceptions. Only member or non-member fees are allowed to cover the publication of an accepted paper. Student registration fees cannot be used to guarantee the publication of an accepted paper. If the author registering to cover the paper publication is a student, he has to pay the appropriate member or non-member fee. Members to whom the society bylaws grant special discounts (e.g., Life members of the IEEE) cannot use the discounted rates to cover the publication of an accepted paper: they have to pay the member fee. One author registration will cover the publication expenses of only ONE (1) accepted paper. 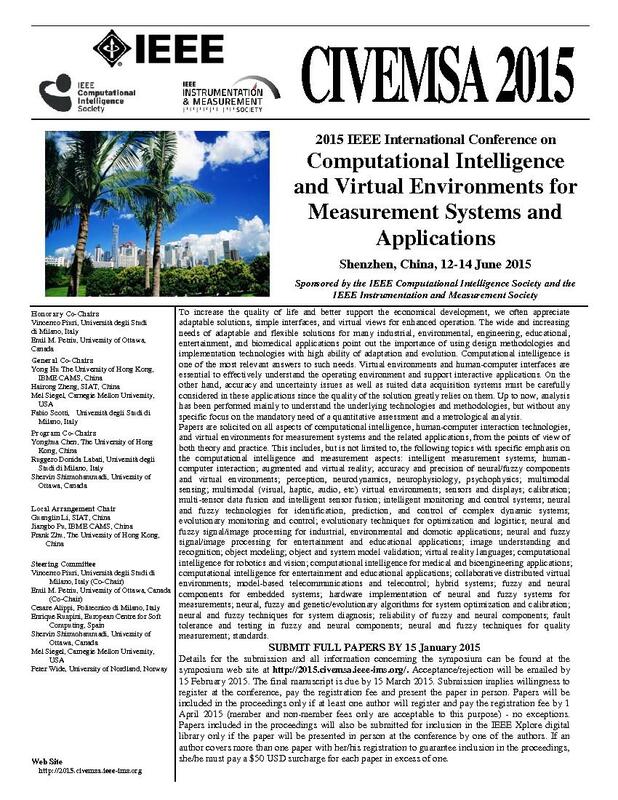 For each additional accepted paper associated to the same registration, a $50.00 US printing contribution will be charged. In the case no registration has been received and correctly processed to cover the paper publication, the conference organizers will contact the authors before the paper is removed from the proceedings. To qualify for member rates, the IEEE membership number must be provided in the registration form. No exception.